Donald Trump has won one of the most acrimonious presidential elections battles in recent US history. 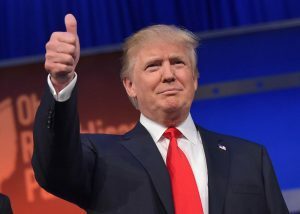 He will become the most powerful man on the planet and the leader of the world’s largest economy. You might think, therefore, that the outcome of the election will lead to some big shifts in our investment strategy, but it will not. Here’s why. Current market prices are an up-to-the-minute snapshot of the aggregate expectations of market participants. What this means is that the millions of market participants around the world are acting (transacting) on their expectations about future returns. Buyers and sellers are exchanging opinions about future returns at the same time they are exchanging assets, and those opinions include views about the impact of the election. Unanticipated future events may lead to changes of opinion, but it is unlikely that investors can gain an edge by attempting to predict what effect the election will have on markets. 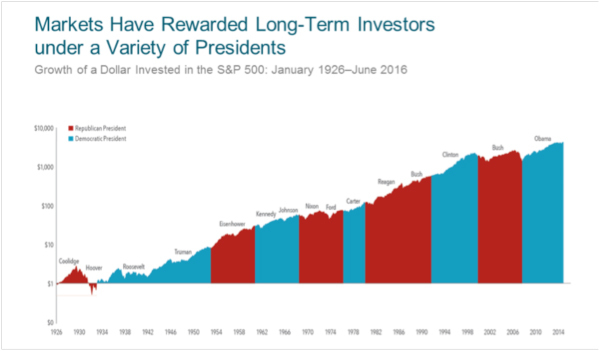 And this chart illustrates that regardless of which party won, the US stock market has provided substantial returns. This result is because the stock market is powered not only by decisions made by political leaders, but by a complex blend of (among other things) commerce, enterprise, risk, finance, hard work and innovation. Did you know, for example, that the number of US patents granted in the US since the 1960s has tripled? It is no wonder that markets thrive, regardless of political regimes, and will continue to efficiently allocate capital for innovation, progress and profit. It is reasonable to apply the same long-term thinking to other markets and other big macro events, such as Britain’s exit from the EU and leadership changes elsewhere in the region. We do not know what the outcome or effect of these events will be, but we do know that markets express aggregate expectations in prices and that long-term returns reward patient, disciplined investors. If you would like to arrange an investment consultation in light of the US election result, then please call Tim Norris or Alan Clifton on 0800 731 7614 and we would be delighted to arrange a meeting at our offices in the heart of Teddington.